Ota-san of Wakknopan Breads. Yummy! This second weekend in May looks as promising for weather as it does for markets. 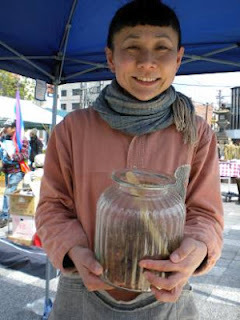 I'll be venturing off to the Earth Day Market in Kichijoji to restock on black rice, mochi, daizu, and more. I can't go too far afield as there's work to be done in the garden and at the farm, and the ever-rising temperatures mean there's no time to waste. The rest of you will just have to wander off to get a taste of other Tokyo markets this weekend. I have no doubt there's a farmer out there with a super-special recipe for that unknown vegetable at her stand. Go get it and report back! A fantastic opportunity to get yummy all-organic and fair-trade goodies in one of Tokyo's niftiest little spots in one of the city's most beautiful parks. Seriously, why aren't you putting this on the calendar?